How many of us would like to send a note to ourselves, five weeks ago, about which NFL players to draft, fade, and which DFS rosters to play? I mean, everyone predicted that Fitzpatrick would beat the Saints and defending World Champs in the first two weeks. Right? 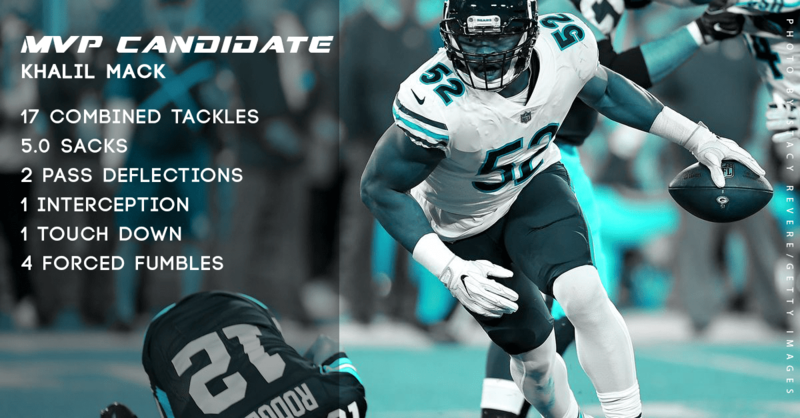 How about the Bears having a legit defender making a case for league MVP? Nope. Not this guy. Truth be told, we shouldn’t be too surprised to see early season breakouts and duds. However, this fantasy (and real-world) season is just too much to handle. Aaron Rodgers (QB15), Tom Brady (QB18), and Russell Wilson (QB20) are not top 10 QBs. Kareem Hunt (RB11), David Johnson (RB13), and Jordan Howard (RB26) are not top 10 RBs. Davante Adams (WR16), Antonio Brown (WR17), and Odell Beckham Jr (WR22) are not top 10 WRs. Ryan Fitzpatrick is ranked QB4 and no longer a starter, nor injured. Aaron Rodgers’ and Alex Smith’s fantasy points combined only beat Patrick Mahomes by 1. T.J. Yeldon has more fantasy points than David Johnson. James Conner has more fantasy points through the first 4 games than Bell’s first 5 games last year. The Bears are the top scoring DST, averaging 18.5 FPPG. If Baker Mayfield played the same amount of games as Deshaun Watson, they’d be tied in fantasy. Michael Thomas has a 95.45 catch percentage and on pace for 168 receptions on the year. Julio Jones is on pace for 2,008 receiving yards…and zero TDs. 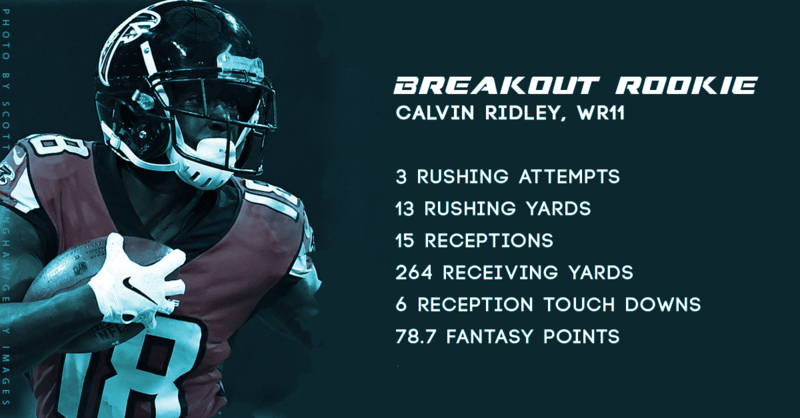 Rookie Calvin Ridley is on pace for 24 receiving TDs. Ezekiel Elliot is on pace for 1,704 rushing yards. Alvin Kamara and Todd Gurley are on pace for 24 total TDs, each. Carlos Hyde is on pace for 20 rushing TDs. With a minimum of 25 carries, the top 2 RBs (avg. YPC) are Matt Breida (7.6) and Austin Ekeler (6.7). Jared Goff is on pace for 5,624 yards, 44 TDs, 8 INTs and a Super Bowl appearance. Eli Manning’s 99.1 passer rating currently bests Rodgers (97.4), Brady (94.0), and Stafford (92.5). DeMarcus Lawrence, J.J. Watt, and Khalil Mack are on pace for 20 sacks. Bonus: The Buccaneers have more total offensive YPG than the Saints, Steelers, Falcons, Chiefs, Packers, Eagles, and Patriots each. Yeah, let that sink in for a moment. Yes, on pace is merely the ceiling, but the stats are still telling. Undoubtedly, the first quarter of the season did not play out as most of us thought it would. Yes, there are players that were worthy of our first or second round picks: Alvin Kamara (RB1), Todd Gurley (RB2), Melvin Gordon (RB3), Saquon Barkley (RB4), Ezekiel Elliott (RB5), Michael Thomas (WR2), Mike Evans (WR3), and DeAndre Hopkins (WR4). For the suckers that refuse to wait to draft QBs and went with Rodgers, Brady, and Watson within the first 3 rounds are stuck with QBs scoring less than Mahomes, Matt Ryan, and Goff; all of which had ADPs between the 12th and 16th round. Oops. Let’s not even get into the Le’Veon Bell drama. Talk about a fantasy football dilemma. If you were savvy and picked up Conner to supplement your wasted first-round pick, maybe it’ll still pay dividends. Bell is reportedly supposed to finally report during the Steelers’ week 7 bye. Good on you. If you own him, sit on him, unless of course you get an offer you cannot refuse. If he plays the back end of the season, he will do his best to prove that the Steelers made a bad call. They will also run him into the ground and get their pound of flesh before he leaves Pittsburgh. What’s the fantasy outlook for most of your roster? No one truly knows. However, historical analysis shows that at this point in the season, those who are performing like studs end up sustaining that level of play throughout the season. Duds, at best, improve their play. However, it’s safe to say that Russell Wilson may not finish in the top 10. David Johnson could very well not surpass the 1,000 rushing yards mark, much less 1,500 all-purpose yards. With those possibilities, it is imperative that you work the waiver wire and hope for trade partners. Don’t trade your studs, unless you’re loaded and need to balance your roster. Most importantly, don’t give up the fight. Even at 0-4, you could make the playoffs. The true determining factor are your ‘Points For’ (PF) If you’re within 50 points of the top 4, there’s hope. If you’re facing a 100+ PF deficit, you have some work to do. PF is the stat line a lot of people forget about. It’s important because it lets you know your team’s potential and ceiling. As the season progresses, you’ll notice that the PF, not so much ‘Points Against’ (PA), is a true indicator on who has a shot at the playoffs. Come playoffs, all bets are off and then it’s whose players show up and whose players do not. These are my picks for the 2018 draft steals to date. I define draft steals as players that are producing fantasy numbers that far exceed their ADPs, not to include rookie breakouts. They also show the most consistency through four games and do not exhibit any signs of slowing down. Patrick Mahomes, QB (ADP 107.0) Round 11.4 – Currently ranked QB1 with 1200 yards passing, 14 TDs, and zero interceptions. If you took a shot and picked him up in the draft, kudos to you. All the signs were there. The Chiefs traded up in the 2017 draft to get him, they traded away Alex Smith following his MVP-worthy season, and all of the metrics on this kid were through the roof. 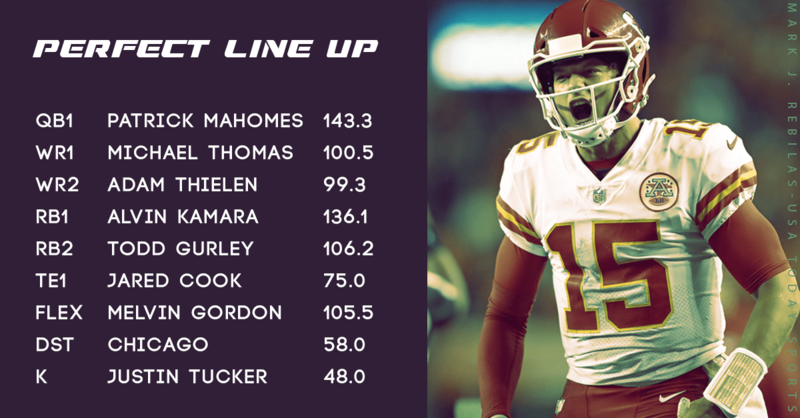 To top it off, Mahomes is surrounded by the league’s top TE, fastest WR, a high-end WR corps, and one of the top RBs. I smile when I go to set my line up and see his name atop of my roster. Jared Goff, QB (ADP 107.5) Round 11.5 – Currently ranked QB3 with 1406 passing yards, 11 TDs, and 2 INTs. The Rams’ offense is arguably the best in the business. You can argue between the Chiefs and the Rams. Goff is leading this high-powered offense like a first overall pick should. With Gurley in the backfield and Cooks, Kupp, and Woods on the outside, the Rams’ offense is a nightmare for defensive coordinators. Don’t be surprised if Goff and Mahomes finish in the top 3 for MVP. James White, RB (ADP 120.9) Round 13.0 – Currently ranked RB7 with 110 rushing yards, 1 rushing TD, and 22 receptions for 193 yards and 3 TDs. It’s always hard to depend on anyone on the Patriots’ roster not named Brady, Edelman, or Gronk. With the early season exit of Rex Burkhead and Brady’s utmost trust in his proclaimed Super Bowl 51 MVP, White has emerged as the go-to PPR monster. To our surprise, Sony Michel’s presence is not hurting White’s production. He’s an high-end RB2 until further notice. Carlos Hyde, RB (ADP 82.6) Round 9.6 – Currently ranked RB8 with 285 rushing yards, 5 rushing TDs, and 4 receptions for 15 yards. His ADP was attributed to (rightfully so) the fact that he was joining the league’s worst team, has an extensive injury history, and rumored to be in a full RB committee. Hyde is still splitting carries, but he’s averaging 20.75 rushing attempts per game. The Browns’ offense is producing and he’s a key piece of Todd Haley’s offense. Just keep your fingers crossed that he remains on the field and not watching from the sidelines. Brandin Cooks, WR (ADP 62.2) Round 6.9 – Currently ranked WR11 with 23 receptions on 33 targets for 452 yards and 1 TD. Let’s be honest, how many of us assumed his production would slip going from Brady to Goff? Raise your hand. Don’t lie. I see you. Though his TD count doesn’t jump off the screen, Cooks averages 19.7 PPG (yikes). Considering the fact that he’s the WR1 for the NFL’s most explosive offense, he should continue to produce as Goff’s primary downfield, speedy target. It’s rare that a top tier wideout like Cooks bounces from team to team; much less three teams in three seasons. It’s also rare that WR moves from one future Hall of Famer to the next (Goff pending). Over the past three seasons, Cooks averaged 1,131 receiving yards and 8 TDs. He’s on pace for 1,808 yards. Even if he shaves off 500 yards, I’ll take 1,300 yards and 8 TDs for a 6th round pick. Oh, look…more Rams’ WRs. Woods (WR15) and Kupp (WR5) are better steals than Cooks, however Cooks is a proven consistent fantasy producer and is (arguably) the Rams most talented wideout. If you own any of these three WRs, Gurley, or Goff, you’re sitting pretty. We don’t want to panic just yet, but we’re close to giving up on these players that are playing embarrassingly below their ADP (or not at all, even though healthy) in no particular order: Russell Wilson, Kenyan Drake, Le’Veon Bell, and Larry Fitzgerald. I agree that it’s still early. Every single one of these players can bounce back and do so in grand fashion. I (personally) just don’t have a good feeling about any of them and glad that I faded every single one during every draft I was in. Four weeks of play is a solid indicator of who’s on pace for a stellar year and who’s not. Of course, the winds shift just as fast as Tyreek Hill. If you’re sitting at 0-4, you’re not happy and doing all that you can to bounce back. It is very possible. It’s also probable that a 4-0 team doesn’t even make the playoffs. Four weeks came by fast and we’re 72 hours away from the conclusion of Week 5. Players can step it up, recover from their current injury, get hurt, and even get traded. Every single scenario affects your team. Here’s to hoping it affects it for the better. Good luck and don’t forget to offer your sacrifices to the fantasy Gods. They tend to prefer chicken wings and beer, as do I.